Rope operated catches for ease of adjustment. Ultra comfortable D shaped rungs. Secure feet for hard surfaces swivel to 'spike' mode for softer ground. Top rung is complete with pole bow for work against columns. Feeling secure while working at height is extremely important, as it allows the user to confidently work at height. This glassfibre rope operated double extension ladder is a great choice as it has rope operated catches so it can be easily adjusted. It is insulated to 25,000 volts and the top rung has a pole bow so it's easy for you to complete work against columns. 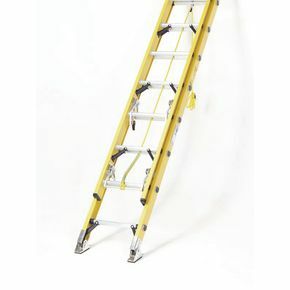 This ladder has comfortable D shaped rungs and secure feet for when you are working on hard surfaces and for when you are working on soft surface it has a swivel to spike mode which gives you added grip. When you buy this product you'll have the option to choose your preferred closed height and extended height so you're able to buy a ladder that's suited to you. 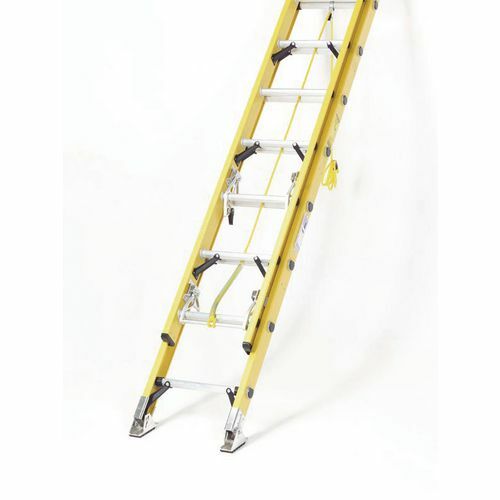 Our glassfibre rope operated ladder is an EN141 approved quality made product with 150kg load capacity. This product also has a five year warranty, 60 month guarantee and FREE UK Delivery.